This is the first time we have seen a t-shirt that is fashioned from two different fabrics, and we guarantee that you will LOVE the result. This soft flowy ladies' henley t-shirt has long sleeves and 3-buttons. 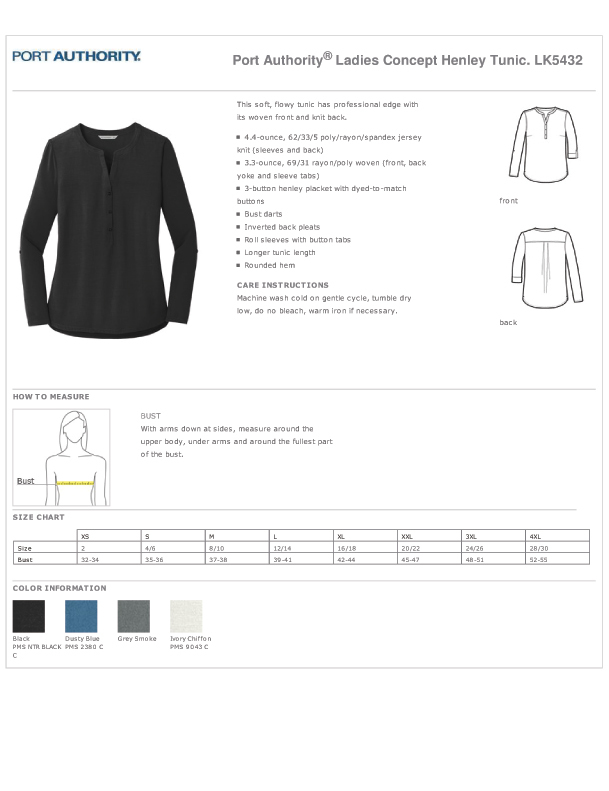 The awesome fabric mix is that the sleeves & back are cut from a 4.4-ounce jersey knit blend of poly/rayon/spandex; while the back yoke, sleeve tabs & front consist of a lesser stretching woven blend of rayon/poly 3.3-ounce. Stunning to say the least. There are inverted pleats in the back that allow greater movement when stretching. The body length is longer & the hem is rounded. Sleeves are a roll style and include button tabs. Shop from four colors with sizes ranging from extra small to plus 4xl. Our online size chart can help you determine the best fit before ordering.